When Donald Trump went after French president Emmanuel Macron in a series of tweets this week, he complained about the fact that France makes it very difficult for the U.S. to sell its “excellent wines” in France by charging tariffs. As the following chart shows, it is certainly true that American wines don’t sell too well in Europe’s traditional wine countries. 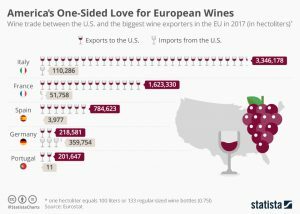 But knowing how proud Italian, French or Spanish people are of their wines, it is highly doubtful that their lack of interest in California’s finest grapes has anything to do with tariffs.